I am super excited to tell you something! I would assume you are all holding your breath in excitement... Right? 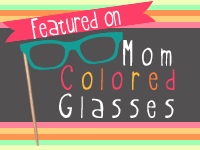 I am guest posting at Mom Colored Glasses this month! 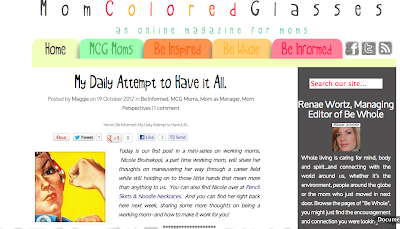 Mom Colored Glasses is an online magazine for moms. It is written by real moms, just like us. Their articles are informative and give their readers all sorts of information about relevant topics. I have found recipes, projects to do with Myles and Jillian, information about living green, and many other topics that moms want to read about! I'll be sure to link up my articles, so you can keep up with me over there if you would like!